Yesterday, a DGIF biologist searched around downtown Richmond to answer that very question. Over the last week, the birds’ activity at the Dominion building’s louvers seems to have ceased. 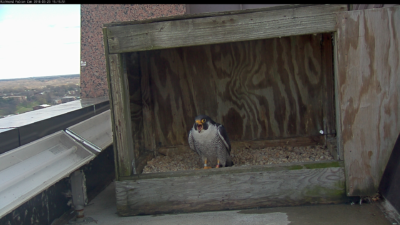 Since last Friday, the male peregrine falcon has been seen intermittently back at the Riverfront Plaza building’s nest box, but it has now been quite some time since we have last seen the female. Male peregrine falcon at the Riverfront Plaza nest box last Friday, March 23. On this day, the male was observed making frequent, but brief trips in and out of the nest box and often times calling. Male peregrine falcon on the ledge parapet of the Riverfront Plaza building on Wednesday, March 28. Yesterday, our biologist checked the nest box at the Dominion building, but there were no eggs and no female to be found. He also checked the Bank of America building, where the falcons had attempted to nest in its west-facing louvers in 2009 but abandoned the site after an egg rolled out of the louvers and broke on the parking deck below. Our biologist checked these louvers yesterday, but found no eggs nor any debris for the birds to create a scrape. He also checked the Lee Bridge in Richmond, but found no signs of the falcons’ activity there. 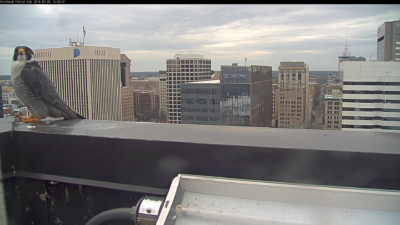 At this point, we can confirm that the male peregrine falcon is still present in downtown Richmond and active around the Riverfront Plaza building. We cannot say the same about the female. It is possible that we have not observed the female lately because she laid eggs somewhere unknown and is sitting on them, but it’s also possible that she may have left the area. 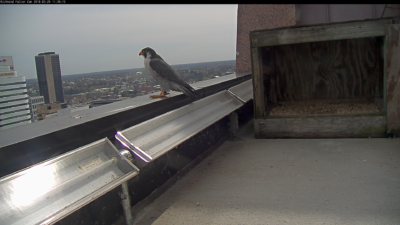 However, due to the male’s reoccurring activity at the Riverfront Plaza nest box, we remain optimistic that the female is still around somewhere nearby. Male peregrine falcon on the ledge parapet of the Riverfront Plaza building on Thursday, March 29. 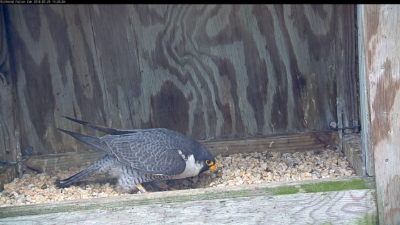 Male peregrine falcon maintaining the scrape inside the Riverfront Plaza nest box on Thursday, March 29.